October contest winners. Congrats again. Savergirl won twice! October 1st. Margie S. $25 Walmart Gift Card October 3rd. Jennie R. $25 Lush Gift Card October 4th tbizkit2011 $10 Amazon E-Code October 8th Sven $25 Target Gift Card October 8th deckerstacie $10 Petsmart Gift Card October 10th mvhsgymnast $25 Fred Meyers Gift Card October 15th j8men $25 Walmart Gift Card October 15th musiciantype $25 Amazon E-Code October 15th qwers $10 Target Gift Card October 17th forbetsy $25 Target Gift Card October 22nd littlewing78 ?? Did you get my email? October 22nd savergirl $25 T.J. Maxx Gift Card October 22nd dragonlady $25 Lancome Gift Card October 24th momof3boys04 $10 Walmart Gift Card October 24th djlovesme $25 Walmart Gift Card October 26th qwers $10 Target Gift Card October 29th TXYOG142 $25 DSW Shoes October 29th savergirl $25 T.J. Maxx Gift Card October 29th KaseyJ $25 Amazon E-Code Contest Rules: Last Friday, we had a Halloween Contest here: http://www.freegrabber.com/free-grabber-halloween-contest Vote for your favorite comment from that contest. Example: My favorite one is from Snevels. Prize: I'll tally up the votes and give $25 gift card to most voted winner. Second winner will be drawn randomly from this contest for $25 Gift card to any online retail store. 2 winners will be announced this Friday. Happy Halloween! My Vote & favorite is the following! 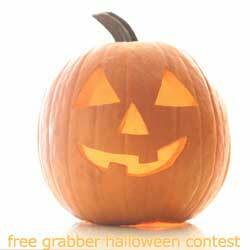 I should Dress up as one GIANT FREEBIE..and wear all the freebies I have gotten! My favorite is from dbrown50. Love the chick magnet idea! I like also the comment of iluvfreebies. I liked majorchaoz’s Chia pet idea. loved Majorchaoz Idea of the Chia pet costume!! Sanditerese was my favorite, what a great idea……sounds like a blast. my vote goes to nursejean.she sound excited about halloween. I liked Snevels post the best! I vote for my own post from last week. Michael Myers is known for Halloween! holmes2374 is my favorite because he, and the rest of the staff, dress up for the kids at the childrens home where he works! I would vote for myself, however, if I should pick someone else, it’d be cln1812 with the painted baby belly. majorchaoz was the best i thought. cln1812 painting the pregnant belly… cute! Iâ€™m dressing up as a cynic this year. The bad news is that everyone will recognize me instantly. The good news is that I already have my costume. my favorite would be cln1812 cause of the baby belly thing i think that just sounds to cute for the baby book! I liked Snevels idea. Michael Myers is always scary and I love the Halloween movie series. i wiil join the crowd,and vote for myself too. good idea. everyone else could vote for me too, if they like.lol. my favorite is LISAKAT1966!!!! THAT IS A WINNER!!!!! i like peanut so my vote is for lisakat1966!! so funny!!! hey everyone is voting for themsleve so here is my vote for LISAKAT1966!!!!! my favorite halloween story is from LISAKAT1966!!!! I LOVE ME SOME PEANUTS!!!!!! I like golfwidow’s about going as a cynic. Clever and funny. I LOVE THE PART OF LISAKAT1966 BEING DRESSED UP AS A BAG OF PEANUTS USING REAL PEANUTS.. THAT IS A HOOT!!!! YOU’VE GOT TO BE BRAVE TO WEAR THAT!! I VOTE LISAKAT1966!!! my vote is for lisakat1966 …..
i like the idea lisakat1966 had for halloween!! i vote for lisakat1966…..